Recurring fashion for teardrop type of caravans has been picked up by the Turks. But what they’re doing with these (and not only these) caravans may surprise many caravanning enthusiasts. Turkish “teardrop” caravans are sold in Europe under the name Turtle, but in Turkey they’re called Caretta and are available in a much wider number of versions. Civilian versions of the caravans Basoglu Caretta are marked as 1200 and 1500, and are the main export product of the manufacturer. Model 1200 weighs 375 kg and has a length of 3853 mm. Galvanized chassis and Al-Ko suspension are supposed to be a guarantee of quality. 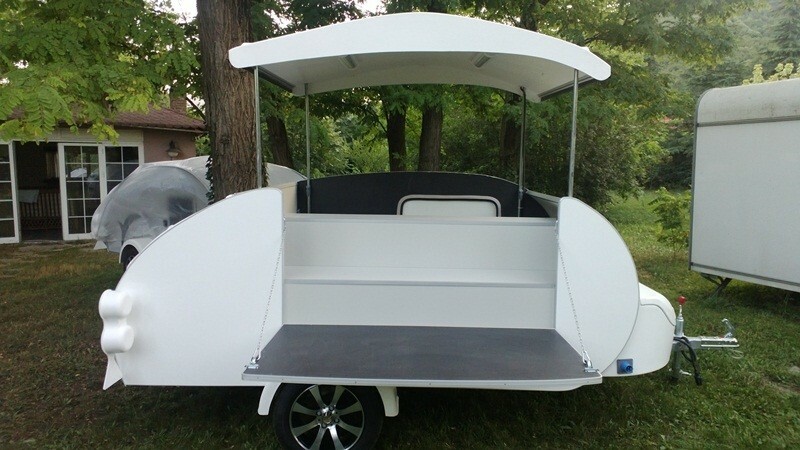 The caravan can accommodate two persons, it has a set of cabinets, radio, ventilation and an alarm. You can also install a refrigerator, a small LCD TV and a DVD player. Model 1500 (of the same length) is a richer version, with a brake and with more possibilities for retrofitting. The vehicle weighs 460 kg. You can enrich it with a panoramic roof, heating Truma and a solar panel. The standard goes with an electronic control panel. It’s difficult to admire standard models, when the offer has a true ... Well - what? Carriages? Coaches? 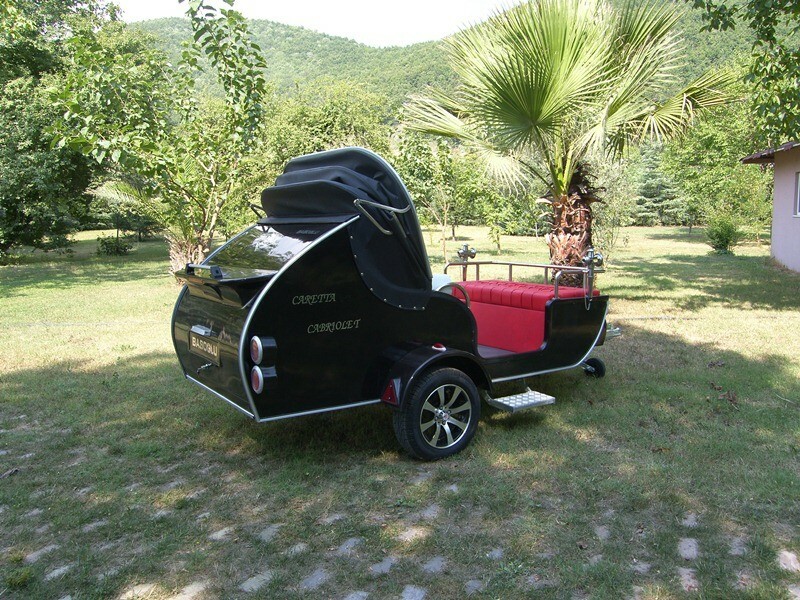 Caretta Cabriolet is a crossing between a caravan, cabriolet and britzka, although such explanation doesn’t say too much until you look at the pictures. Rear of the vehicle is the same as in models Caretta 1200 and 1500. Under a folding roof in old-fashioned style you can find quilted couch, and on the opposite side - a seat surrounded by aluminum railing with lamps in antique style. Such an original vehicle can be successfully connected to the car or... quad. Unusual set will serve perfectly, for example, as a vehicle for the wedding. And this compartment at the front - perfect for gifts. Well, not only Cabriolet may surprise you. Turks are still inventing newer adaptions for their caravan. Model Media, with a large TV on the side wall, can serve as an advertising medium. After uncovering, the projected image can be presented to passers-by. The screen may be covered with a special awning, which suits the screen size. In turn, Caretta Bazaar and Caretta Shop are models dedicated to street vendors. Such store has everything they need. Inside, of the course, you can install the cabinets, refrigerator, and adequate facilities. The sunroof protects against sun and rain. There’s also a fold-out counter, where you can display your products. And when the evening comes, all can be packed in just few minutes and you can drive away to home. 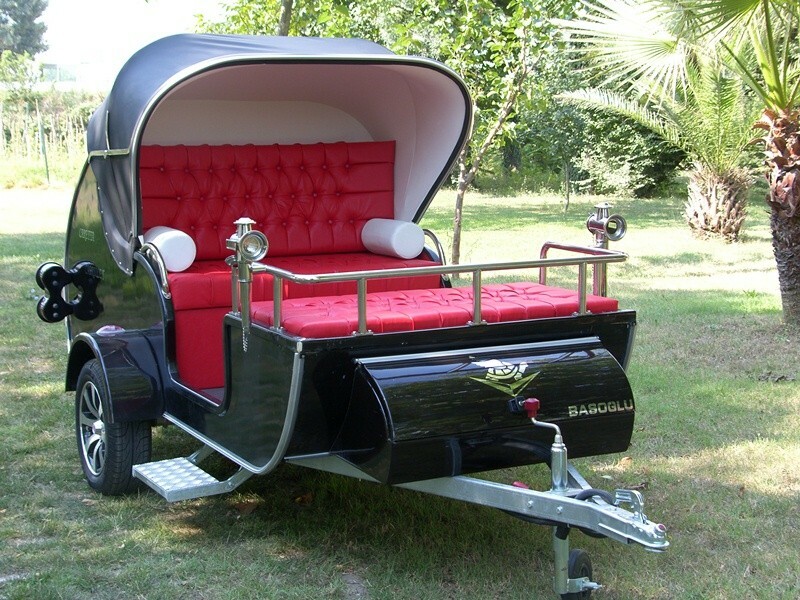 In its offer, Basoglu company has not only caravans based on a model in the shape of a teardrop. 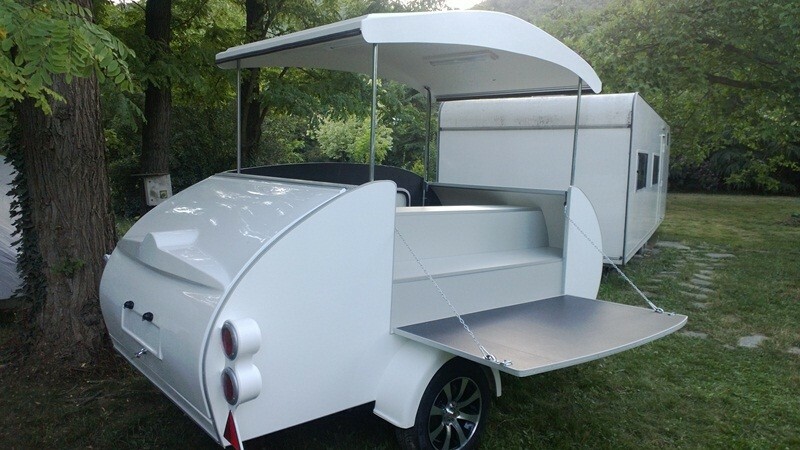 One of the interesting special products are... hotels on wheels. The manufacturer directs his offer to hotels, which can accommodate the surplus of tourists in specially adapted caravans during high season. Some even have windows identical to those used in residential buildings. In Basoglu you can also order an office on wheels. Besides, experts from Turkey are probably able to build or convert into a motorhome almost every vehicle. I guess that even if a client came to Basoglu with a tank, employees wouldn’t have any problems in turning it into a motorhome. Mobile house - an alternative for a caravan?